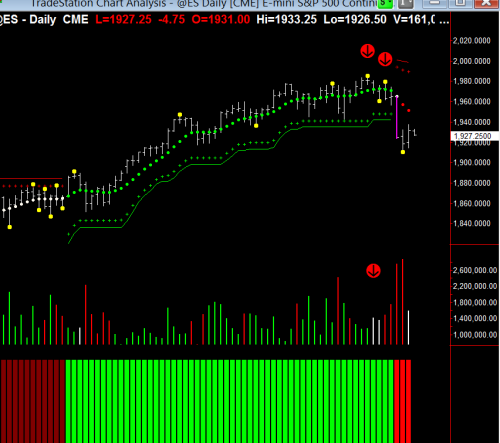 The Emini’s Recent Drop? Here’s What Hawkeye Foresees! 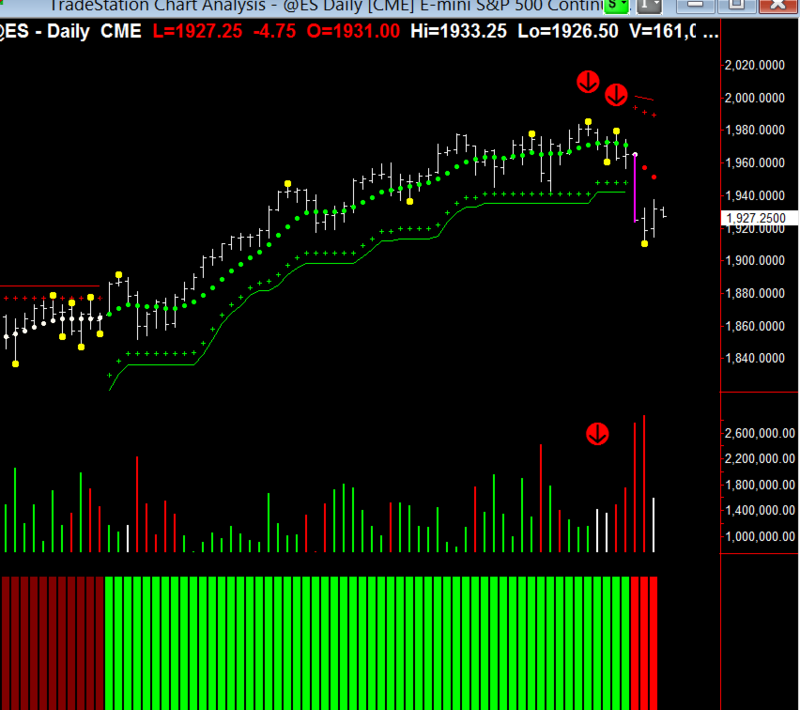 Recently, there was a big downward move in the Emini. So, in today’s article, I want to examine that move using my Hawkeye Volume trading methods. First, let’s have a look at the monthly chart. If you look at the red arrow, you can see that it is 50% of a Hawkeye isolated high. 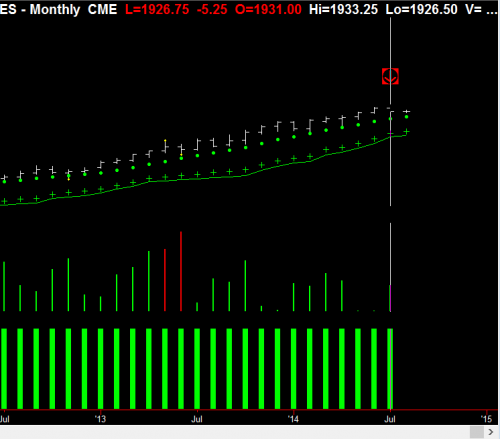 If this month’s bar does not make a higher high than July, we will see a yellow Hawkeye Pivot dot appear. That means we should expect a minimum of three (and possibly up to five) months of bars back down against this uptrend. Also, you can see that we don’t have much volume, indicating there isn’t much buying going on. Next, let’s have a look at the weekly chart, which is showing us something quite interesting. If we have a look at the arrow at the bottom of the chart on the Hawkeye Volume, you see it shows us that last week, there was red selling that went on into the market. Now, the two red arrows at the top of the market show a double top, along with the two yellow Hawkeye Pivot dots. If you draw a line across the high of the first Pivot, you will see there was resistance that also stopped right on the second Pivot dot. So, it’s clear that the market is rolling over. 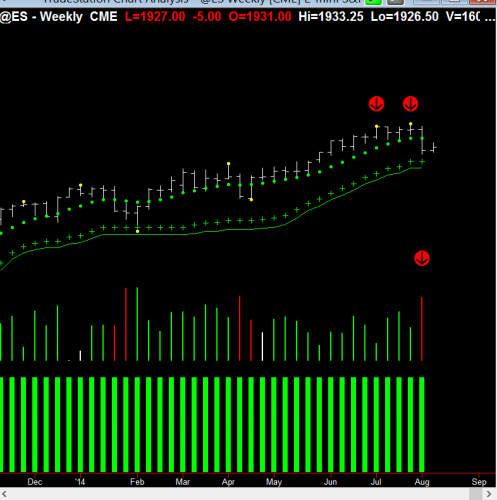 This is also confirmed in that we have red Volume, and the weekly Trend dot has gone flat. Lastly, let’s go have a look at the daily, because this really does tell us the full picture. 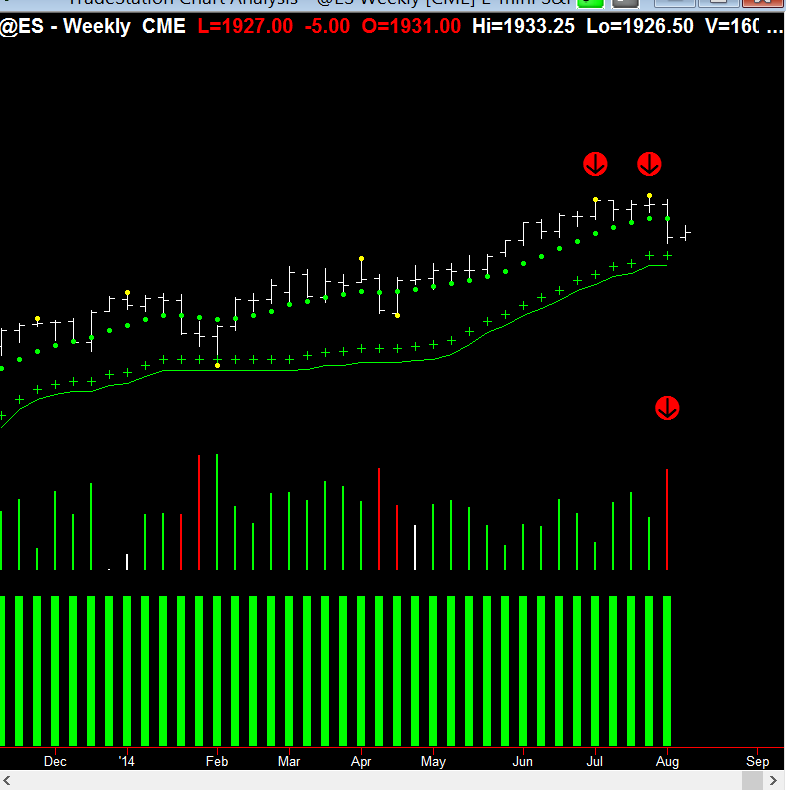 Here, on the daily chart, notice the red arrow on the bottom, which is showing us the volume. Four days before the sell-off (the magenta wide bar), Hawkeye Volume was telling us that the professionals were getting short in this market. Also, notice our two arrows at the top, which are showing us the yellow Hawkeye Pivot dots. You can see that the second red arrow down is lower than the first. This is also indicating that this market is in decline and will be sold off. Then, we have a yellow dot, which is the Hawkeye Pivot right at the bottom, and so we’re expecting a three bar reversal off of this. However, as I write this to you, (which is on August 5th) you can see that the market is coming down. And, if it continues coming down during the day, another yellow dot will be placed on yesterday’s bar, or it will become a phantom. Either way we look at it, this market is showing extreme weakness at the moment, and certainly, you should not be buying any stocks at the moment. You should be tightening your stop losses, because this could be a major move coming into the summer period. So, be aware of what is happening. Keep your eyes peeled, and make sure you follow the Hawkeye trading rules.